Ideal for toddlers through age 5 years. There are swings, slides and climbing structures. 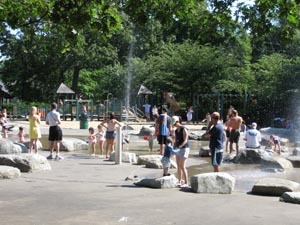 The primary attracton on hot summer days, however, is the 'Spray Pool' - a nifty area with water spraying out of ground vents and boulders for kids to climb over. There is a lifeguard on duty. The area backs onto Beaver Brook Reservation, which has a stream and picnic tables, and a large area for softball & volleybal games. There are also two covered pavillions for picnicking. Restrooms are available on site when the park is open. May 24 - September 1, open daily 9:30 a.m. – 7 p.m.
MBTA: Red Line to Harvard Station. MBTA Bus #73, Waverly Square (20 minutes). Exit on Mill Street onto Trapelo Rd. Park is located on either side of Trapelo Road. Headquarters is on Mill Street, the first house on the left. By car From Route 128: Take Exite 28A/Trapelo Road East, toward Belmont. Proceed 3.4 miles to the third set of lights and turn right onto Waverly Oaks Road. Parking lot is on your left. The Spray Pool and Tot Lot are visible from Trapelo Road on the right. just as an FYI you do not need a permit or reservation to have a birthday party here. i called the state department that takes care of this and they mentioned this to me. its on a first come, first serve basis. which is great but i just hope no one else chooses my date to have a party there. just get there and set up early. and be kind to the environment around you and throw away all trash used. awesome park i love it and I'm glad i get to have my party here!!!!!! I loved this little playground with the spray pool. Not much parking so go early to get a space. The one issue I have is that there are kids running all around in the water and the ground is cement and there are huge boulders. I was sure that my 3 year old was going to slip and fall and end up in the emergency room. If I go back I will be sure to bring water sure or some kind of shoes with treads. Great for 2-5 year olds when you don't have the time or patience to go to the beach. About a dozen sprinklers...no wading pool. Plus a playground for those that want to stay dry. There are some shaded areas though not in close proximity to the water.